Students across the state study Kansas history in a variety of ways. This is an opportunity to share some of the exciting educational activities that are going on. To have your students work displayed submit your digital pictures and/or selected projects with a brief description. Fourth grade students in Aimee Dester’s class from Andover eCademy completed an “Exploring Kansas” unit with the help of Read Kansas! cards and interactive online lessons. After learning about the journeys of explorers, traders, and travelers on the trails through Kansas in the 1800s, students were assigned to “become someone on the journey” and create a work of art portraying life on the trail. 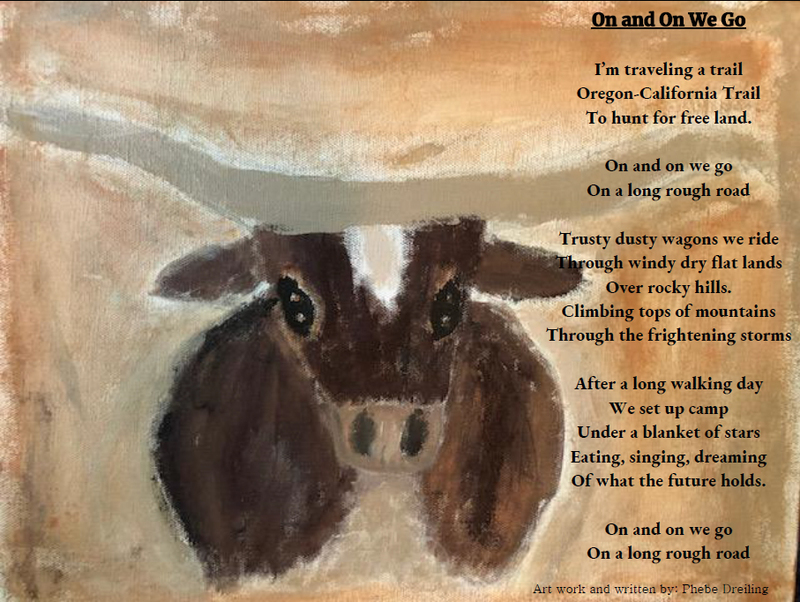 Shown here is Phebe Dreiling’s original acrylic painting on canvas used as a background to her poem. Graber Elementary Presents a "Living Wax Museum"
Students in Jesse Ediger's fourth grade class used the Famous Kansan trading cards as a start to a larger research project. Each student chose a person to portray, did research which was written into an actual research paper with a cover page! As Ms. Ediger said this was "big stuff" for a 4th grade student. Then each student wrote a script which they memorized for the Living Wax Museum. The students invited their families, the other students at Graber Elementary and a reporter from the Hutchinson News to their school gym. The performance continued for two days with great attendance both days. "Thank you for helping me with this amazing project. I think this is something they will remember for a long time!" Jesse Ediger, Graber Elementary, Hutchinson. Fourth graders in Shelby Ross's class used the 150 Famous Kansans trading cards to become acquainted with famous Kansans from the past. They extended their research by using Kansaspedia from kshs.org. From the information they gathered each student will write an informative paper, create a Prezi presentations, and present their report to the class. The students found the trading cards to be a huge motivator as they began their research. Fifth grade students from Indian Valley Elementary, Overland Park, recently completed a project with Angela Guinn, Library Media Specialist. She had the students doing a research project based on the Famous Kansans trading cards. Each student was assigned a person but told to keep the identity "top secret". After researching more about the person, the student wrote clues to share with their classmates. Ms Guinn reports "The students had a blast!" Through activities like this students across our state are becoming familiar with the people and history that makes Kansas a great place to live. Students experience history in many ways, but some of the most lasting memories come from visiting the site. Whether it be a boyhood home, a local museum, a State Historic site, or the town cemetery, students have the opportunity to see the person they are studying as real human beings who experienced an event or a time in history. Recently students from both Washington Elementary and St. Marys Grade School visited the Walter Chrysler home in Ellis. Fourth grade teacher Ashley Rohler and media specialist Kerry Bittel provided pictures of Washington Elementary students at the Chrysler home. St. Mary's Grade School fourth grade teacher Peggy Seibel also sent pictures of her class at the site. The students were researching Chrysler and preparing reports to be entered in the local KAYS Club essay competition. Ms. Stacy Russell, fourth grade teacher, sent this information about the activity Haysville fourth graders did for Kansas Day. "I wanted to let you know about the fantastic time our class had using the Famous Kansans trading cards. There are four fourth grade classes that worked together to build a unit to cover some of Kansas' famous persons. We divided the trading cards so no duplicates were used. The students were asked to take information from the trading card to have a starting point, then with further research (with the help of kshs.org) they constructed a 'FACEBOOK" profile' for the Kansan. The kids loved it! It was relevant to their interests and still brought the history back to show importance in their life today. We continued the project by asking the students to dress up like their Kansan, so that we could hold a 'wax museum' in the gym for other grades to come visit. As the visitors arrived they tapped a red dot (button) on the Kansan's hand and heard a short speech about the person." Students from Ms. Jeri Powers' fourth grade class in Prairie Ridge Elementary, USD 232 Desoto have been studying immigrants to Kansas. These students used the I-P Immigrant Contribution lesson from the Read Kansas! series as a model. Each student researched an immigrant to Kansas. Using the lesson as a model they learned to chunk text, add text features, and develop a hook to catch the reader's attention. The flyers were made with a program called Smore. We are very proud of their efforts and glad that they chosen to share the results not only with us but also with you. Mrs. Minneman's class in Salina used the 150 Famous Kansans trading cards for research. Each student chose a Kansan and portrayed that person on Kansas Day. Students at McClean Science and Technology School in USD 259 used technology and the 150 Famous Kansan trading cards to learn more about Kansas personalities. Students in Michelle Smith's 4th grade class at Nickerson Elementary shared some of the "famous" Kansans who visited their classroom during Kansas Day. During the 150th anniversary of the Civil War many Kansas students became acquainted with the history of the early settlers of their community through the Sleeping Heroes project. Hundreds of Civil War veterans, both Confederate and Union, took advantage of the low prices for a homestead in Kansas. Students from across the state combed their community cemeteries to find these veterans and add them to our growing database. Glasco Grade School initiated this project. Fifteen students of USD 383 teachers, Karen Morton and Terry Healy with adult assistance from members of the Polly Ogden Chapter, NSDAR and the Riley County Genealogical Society researched and photographed grave sites of Civil War soldiers buried in Sunset Cemetery in Manhattan. On a beautiful fall afternoon, students matched the names they had researched to the tombstone and took pictures and corrected their information. That information was then submitted to the Silent Heroes project at Kansas State Historical Society. Students commented that it was "Fun but challenging." Not all soldiers were found and another field trip next year was planned. Students working with Wendi Bevitt have been recording information concerning Civil War veterans buried in the Burlingame cemetery. They have found almost 150 of these Sleeping Heroes. One of the most interesting things they have found concerns the Colored troops who fought during the War. Two black and three white veterans have been found that were associated with this group. We certainly thank Wendi and the students for getting involved with this project.